When the Independent's crusty old coach took one look at her long, blue skirt, he spit hard on the ground. "Go home missy. You're a girl - and this is baseball". Athletes and sports figures, and their stories are always inspiring. They are invariably people of determination and hard work. But if they are also people who have fought for change, then to say that their stories are empowering almost becomes an understatement. And I am caught up in such a predicament to describe this book. Alta Weiss was the first female pitcher in an all-men semipro baseball team in 1907 in Ohio. This book has been inspired by her life. The story itself is laid out as nine "innings", pointing to various time segments in her life. Baseball was in her blood, clearly demonstrated by an incident of hurling a corncob at a pesky cat in the barn when she was only two. By six, she was throwing ball for hours. And mostly she was bang on target. Those who witnessed it knew she was a "girl wonder" right then. Nothing stopped her. She would wake up just to practise in the barn during the wee hours. Throwing a ball with skill and style came to her quite naturally , be it with the boys in town or amidst grown men on the field. One day, Alta met the coach of the town's semi pro team, the "Independents". He did nothing but doubt her, and her gender. Desperate to find a place in the team, she reminded the coach of the crowd her female presence in the game would draw. The ticket-sales pitch worked and Alta joined the team! Rest of the story is how she made jaws drop at the ball park. 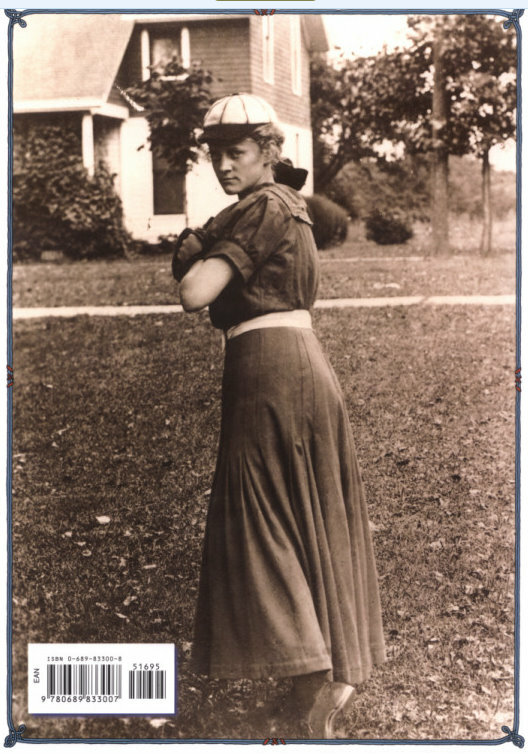 The crowd exploded in shock and excitement as she pitched for the first time during the summer of 1907, while she was still a teenager. Alta Weiss went on to become a doctor, like her dad. But she never ceased to share her story or play ball with any little girl who had a cap pulled down and overalls full of mud. The book carries illustrations in bold and bright acrylics. The drawings have exaggerated features and dimensions that bring in more power and drive to the narration. This book won the Parents Choice Gold Award in 2003. Also, both the author and the illustrator have many wonderful books on their resume. My own little girl's gross motor skills are not sometimes good enough to catch a forceful ball. I would not be surprised if girls like her shy away when the boys at the park or on the street come out with a ball. Reading this book might help. All the more since the back cover of the book (see below) held her attention for quite sometime. wow! Yay. I love such stories! thanks for a nice review. Ah, a book after my own heart. Great review, and what a lovely photograph! Wow! As Arundhati says, me LIKE! Thanks for bringing this to us Meera. Seems like a good one. Thanks Meera for the review. A great story and thanks for the great review. Very enlightening to peek into the story of a never-heard-before real-life heroine. 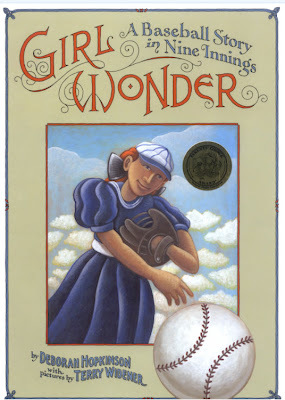 You'd agree one can never get enough of women rolemodels in picture books, especially in the arena of sports. An enticing pick. Thanks! Thank you very much Sathish, WJ, Chox, Lakshmi, Vibha and Praba!